Fayose writes EFCC, offers to report for probe – Royal Times of Nigeria. 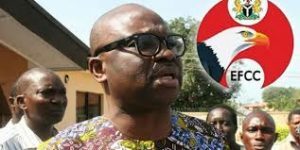 The governor of Ekiti State, Ayodele Fayose, has written to the Economic and Financial Crimes Commission (EFCC), offering himself for probe on October 16. Mr Fayose had in 2016 told the commission to “keep their gun powder dry” and wait till the end of his tenure. The Ekiti governor said his decision was sequel to “several and serial actions of the EFCC for sometime now including the freezing of his bank accounts.” Just last week, the Ekiti State governor-elect, Kayode Fayemi, said he has left Mr Fayose to God over the alleged mismanagement of state funds and resources. The governor’s special assistant on public communications and new media, Lere Olayinka, in a statement today said the governor’s letter was received at the EFCC office in Abuja on Tuesday. However, while reacting to the governor’s letter, Wole Olujobi, spokesman of Ekiti governor-elect Kayode Fayemi, said it is a decoy “to pull a surprise”. 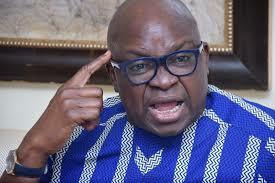 The spokesman said Ekiti people are wise and will not be deceived by Fayose’s “ostrich game”.